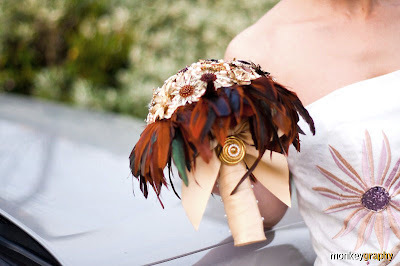 I really wanted to show off my newest bouquet made of Sarah Coventry Sunflower Brooches and earrings as I mentioned in previous blog post as (being honest) I really wanted to get some exposure for it once I listed it in my Etsy store. Well, before got time to blog about it, it's sold! Anyway I cannot help posting it here as I like it so much. So here is my TREASURE bouquet. Fairly big compared to my previous designs, this bouquet consists of many brooches and earrings signed Sarah Coventry , in beautiful pale gold tone with a gorgeous amber glass stone in their centers. I am no expert but many jewellery sellers call this design 'Sunflower' while others say 'Sunburst'. Well no matter what its name is, it's beautiful. 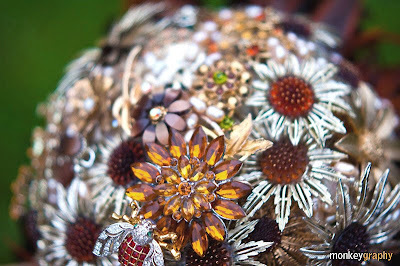 Thinking of autumn brides, I added to the bouquet many vintage brooches and earrings with amber/topaz rhinestones and with a dash of lime green / citrine colour. To make it look more like a real treasure, I added plenty of very pale bright gold fresh water cultured pearls and top it off with the most gorgeous vintage rhinestone pin bumble bee. The backing was made of luxurious soft saddle coque feathers in matching colour. The handle was slightly padded for extra comfort while holding ( and for a perfect smooth and round look), then wrapped with gold satin ribbon with a charming bow accent. In the center of the bow twinkles a cute vintage rhinestone button. I simply loved it when it came out. And here is another good news. 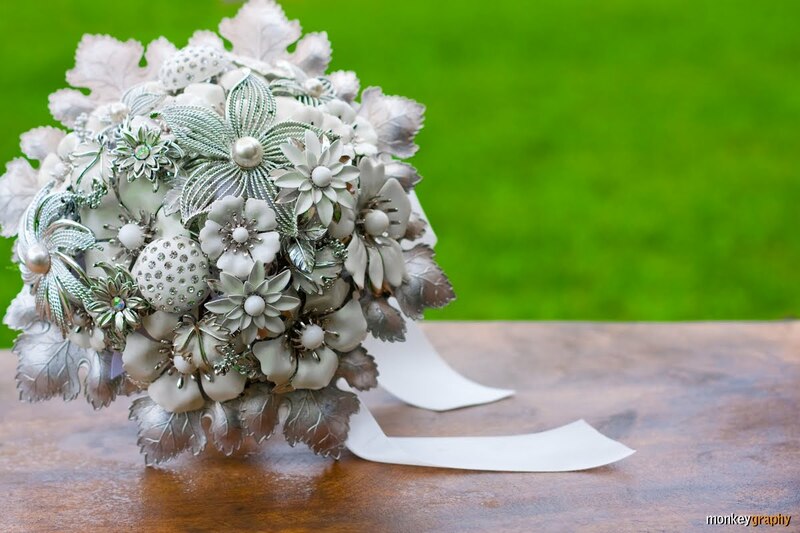 After this 'MAGIC OF LOVE' bouqet in white and silver is sold, so many people asked me to duplicate it. I was not so sure. Now I am able to make this MAGIC OF LOVE design again. 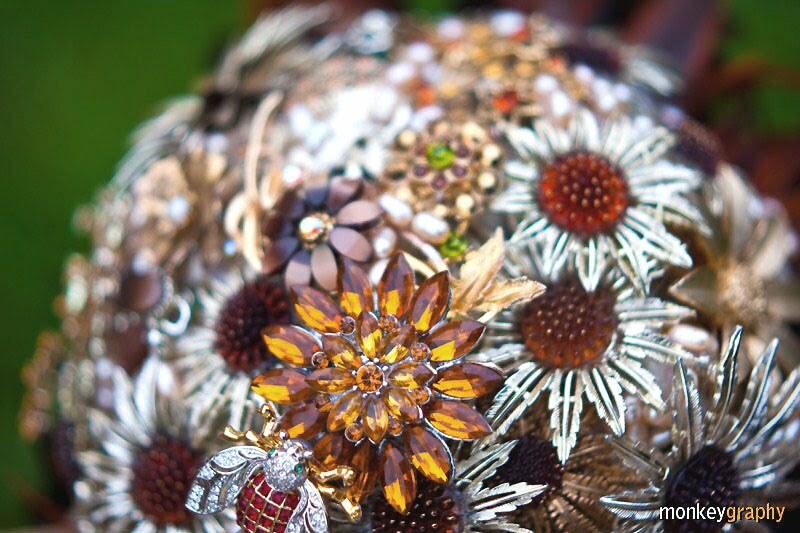 Well it cannot be exactly the same - all vintage jewel bouquets are One Of A Kind! But I've found enough Sarah Coventry 'Summer Magic' brooches and earrings for another bouquet and most importantly I found the beautiful bohemian leaves again, just enough for anoher bouquet. I don't think I can get these gorgeous leaves again once more. Now here is the 'small gift' bit! As I am not able to do a giveaway for this month (life is difficult sometimes and I've been too busy, too), I am offering my blog readers $10 off voucher to spend on bouquets in my shop ( bouquets on clearance sale are excluded). So if you order a custom made bouquet or buy a ready made one in my shop please enter 'BLG' in the 'message to seller' while checking out for a $10 refund. Hope everyone will have a beautiful holiday weekend. Very very beautiful. Excellent. I love it. Thanks for sharing. These are SO FAB! I have listed some rhinestone brooches for sale in my etsy store for this purpose! Cool gift ideas! Wish someone also send me like that. Anyway, I've been looking for topics as interesting as this. Looking forward to your next post. Flowers are really beautiful and it can simply enliven any occasion. If you want to create a dreamy atmosphere in your wedding, you can use silk flowers instead of fresh ones. Beautiful brides with their beautiful bouquet delights only the senses while elegant brides with their elegant silk flowers exudes an aura of grace that is alluded to her beauty in movement and manners.